Recruiting Younger Generations for Ministerial Leadership – Practical. Catholic. Evangelization. Over at the Patheos Public Square discussion, Timothy O’Malley hits it out of the park, saying what’s needed to be said bluntly for some time about Millennials in the Church (and really, in my opinion, anyone under 40). Last week, we considered ways to grow human capital in parish life–and those ideas would certainly apply to all generations. Today I want to hone in specifically on generations and leadership. Rather than study millennials as some foreign entity in our midst, the Church would do well to employ their particular genius for our time. “Foreign entity in our midst” is spot on. Every time (and it’s often) I hear others talk about how “we need to pay more attention to such-and-such generation because they are the future of the Church,” I cringe. Fr. Michael White and Tom Corcoran dispel this well-meaning (but false) idea that we do youth ministry, young adult ministry, etc…for the future, explaining, “Students…are an important part of the Church right now. God very much desires a growing relationship with them and has granted them gifts and talents to serve him and his family” (Rebuilding Youth Ministry, vii). The future is now. We’re right here. Holy Scripture and the saints show us that God doesn’t have a minimum age requirement when it comes to being an instrument of his Spirit. While an increasing number of parishes and ministries acknowledge and live out the reality that people from all generations are in need of life-changing relationship with Jesus Christ that leads to discipleship, what about ministerial leadership? As Jonathan Sullivan observed, “In some corners of the Church there is a consistent undertone directed towards young adults that we are there to learn or be learned about, rather than having anything meaningful to say on our own behalf.” And even in volunteer settings, as Chris Wesley explains, “If parish leaders think about young people at all, they usually consider ways to entertain them or to get their help with projects that other people have decided are good ideas” (Rebuilding Youth Ministry, 2). In short, sometimes leadership is equated to age, rather than attributes. 1. Young adult Catholics need to apply for leadership positions—even if they’ve never seen anyone who looks/talks/acts like them culturally or generationally in the job before. 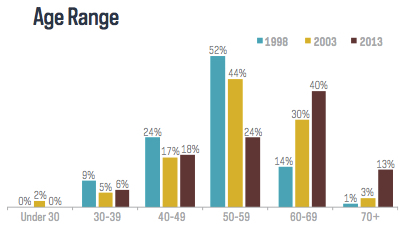 Younger generations are not underrepresented in youth ministry. An unscientific (but still valuable) survey in 2013-14 from Catholic Student Ministry revealed an average age of 30 for Catholic youth ministers. 35 percent of these Youth Ministers have degrees in ministry (or related fields). I wonder, how many of these youth ministers felt that the position of “Youth Minister” was the best fit for their knowledge, experience, and vision. Might some of these lay ministers have talent in strategic planning and coaching/consulting and be better suited for a diocesan coordinator position? Might some be excellent administrators? Could a qualified 30-year old parish Director of Faith Formation oversee direct reporting staff (who might happen to be older)? Absolutely–this happens regularly in the corporate, military, and nonprofit sectors. Has nearly every mega-parish DRE you’ve met been a woman in her 50s? Don’t worry about the stereotype, Mr. “Late-20s with Managerial Experience,” you should apply. Does the position description for a diocesan director of evangelization ask for 5-10 years of parish experience? And you only have four years of experience (and it’s not in a parish)–don’t let that stop you–apply! There’s nothing wrong with Youth Ministry. Some are spiritually gifted and called to it. But other talented, faithful young ministerial leaders are youth ministers simply because it’s the status quo. The expectation. It’s where “people like them” usually work. 2. Dioceses and parishes need to build up their applicant pools. Let’s look at an example where there is significant under-representation. The University of Notre Dame’s Institute for Church Life’s Catholic Social and Pastoral Research Initiative has an excellent study profiling diocesan offices of religious education. The study also reported that 75 percent of directors have a masters degree and 20 percent a doctorate. Again, if a masters degree is the norm, this is very attainable by the mid/late 20s. On the whole, the qualification (KSAPs) in diocesan job descriptions are analagous to many managerial and leadership roles in corporations and nonprofits, and many of these other organizations do manage to fill them with highly qualified young adults in their mid-20s and 30s. Dioceses and parishes can be proactive and recruit in order to enlarge applicant pools. Even if you’re just looking to fill one or two positions (not hundreds, like Waldron), go out and build the applicant pool. Having the right people matters more than having the right curriculum/website/etc.–so invest time recruiting. Use existing staff to generate leads. The best person for the job might not even be looking for one. Waldron offers further advice: Hire people, not positions–“great people seem to fit in well anywhere.” Don’t be afraid to let a job opening sit for a while. It’s okay to hire someone who’s a little bit different than your posted description, but can make a great contribution to your ministry. Does that sound like your DRE or Director position? Do a solid job analysis and identify the KSAPs for excellence–write these into your posting, not all the “other stuff” that mostly describes what past candidates have looked like. Finally, go where qualified younger candidates might be found. Posting a job description isn’t enough–remember, that younger leader isn’t sure an organization like you might ever hire someone like them. Ask around at activities/events targeting young adults. Find masters degree programs to recruit from. You’re not trying to recruit someone to hire, necessarily–you’re recruiting to thicken your applicant pool, so you can then make the best selection. Giving a nudge to a 30-something young adult who is a mid-level manager in a local nonprofit and who has 10 years of involvement in small group ministry as a volunteer is letting him or her know that yes, you’re the kind of person who might interview well for a director position. Despite popular perceptions, the Catholic Church’s organizational structure is extremely decentralized. Canonically, every parish can stand alone in many aspects of administration/management. Every diocese can adopt different priorities. We have to take ownership of this challenge. Those who work in parishes, those who work in dioceses, young adults, those who know young adults, etc. It’s everyone’s problem when perception may be all that’s blocking us from moving toward more optimal ministerial hires. It’s Annual Report Time! Does Your Parish Have One? Amen, Colleen — you knocked this one out of the park! I encourage young Catholics to put their resume out there regardless of whether they have all the “official” qualifications for a job. I was 29 years old when I was hired as director of catechetical services for our diocese — even though I had never worked in a parish setting before (my previous experience was in academia and Catholic healthcare). Which is to say: the Church can benefit greatly by looking past their expectations of what a leader looks like and towards the gifts, strengths, and charisms that are unique to this upcoming generation and who are, I believe, uniquely positioned to answer the coming challenges to the Church. You’re one of the elusive 2-6 percent! 🙂 Thanks for being an important trailblazer and stereotype-changer. Anecdotally, I’d say that a lot of the managerial/administrative, pedagogical, and communications techniques you use seem unique among diocesan directors–just one example of why it’s worth trying to broaden the generational-diversity of those in ministry. Could someone of any age do those same things? Of course! But, does it seem more likely that a Gen X/Millennial might employ some of those techniques? Yes.